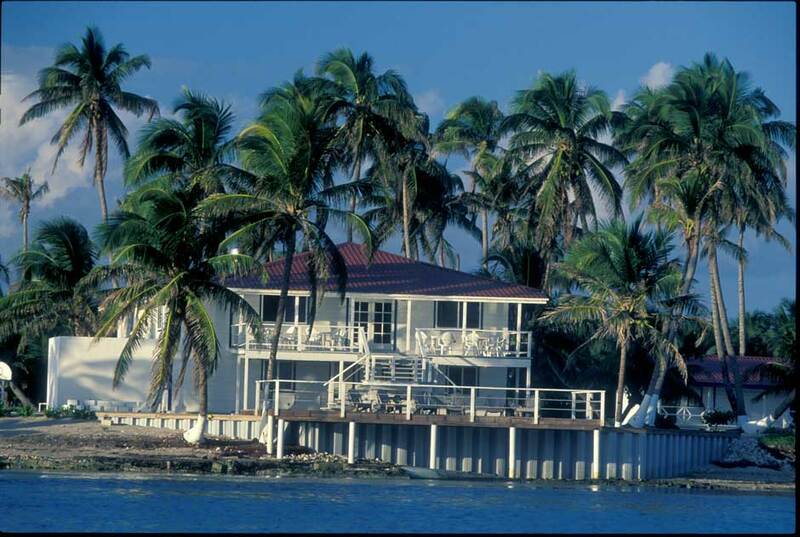 Turneffe Flats Lodge, Belize | Tailwaters Fly Fishing Co.
TURNEFFE ATOLL IS LOCATED THIRTY MILES FROM MAINLAND BELIZE. Direct flights to Belize City (BZE) are available daily from Dallas, Miami, Houston, New York, and other cities. 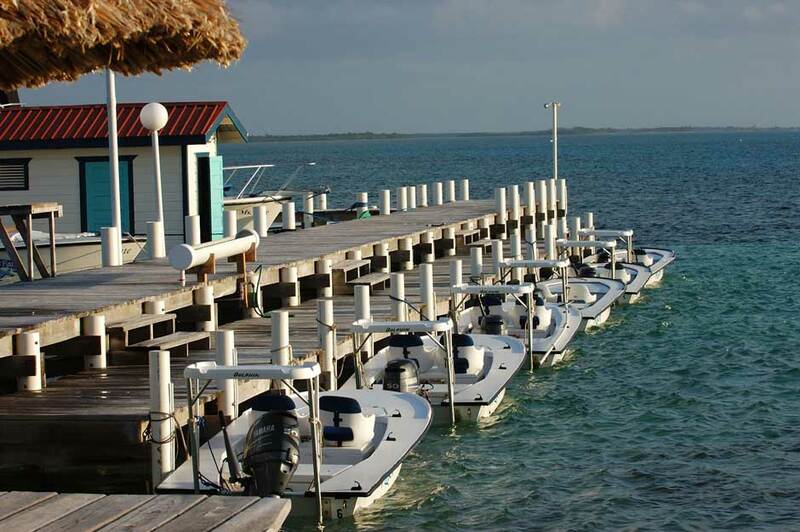 From Belize City, guests travel by boat 90 minutes to the lodge. Bonefish, permit and tarpon are the predominantly targeted species, but anglers will invariably have run-ins with barracudas, jacks, snook, snapper, sharks, and more. Wade-friendly bonefish flats are nearly limitless, and shots for permit and tarpon are a possibility every day. Belize’s southerly latitude makes for great winter fishing. While the spring months are the most popular with anglers, the summer months usually have light southeasterly breezes and larger migratory tarpon. Tropical storms can happen anytime June-November with August-October most likely. Autumn months are normally very consistent and similar to spring conditions. Is Turneffe Flats Right For You? Turneffe Flats is a great destination to consider for folks interested in a Belize trip with a little more solitude. While short weeks are available on a case-by-case basis, their Saturday-Saturday weeklong program is the norm during peak season. Turneffe is considered one of the best permit fisheries in the world, and legions of cooperative bonefish make for a great venue for beginners or novice saltwater anglers to put a bend in the rod. Accommodations are very comfortable and luxurious considering its remoteness, and active non-anglers (especially divers and snorkelers) will be well entertained. 7 Nights / 6 Days Fishing is $4490 from January – June and $3990 from July – December. See “rates” below for shorter week itinerary pricing. Please inquire for pricing for a single room/boat. 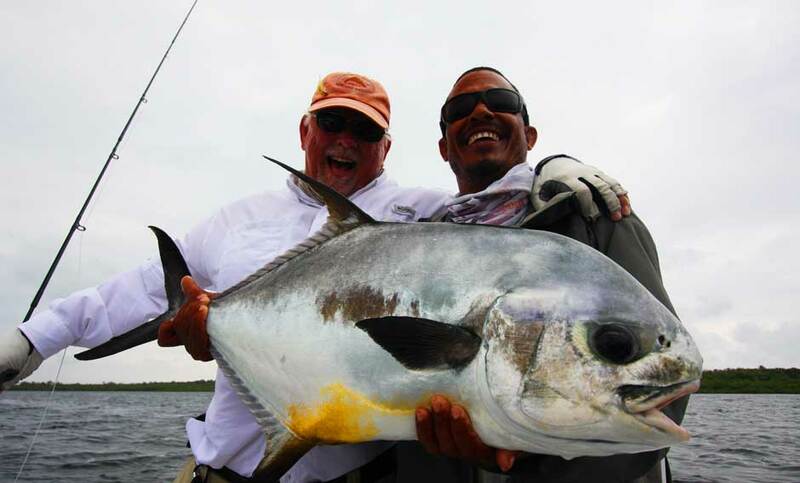 Turneffe Flats is one of the most respected destination fishing lodges in the saltwater fly fishing community. Located approximately thirty miles from mainland Belize, Turneffe Atoll is one of the most beautiful and ecologically diverse islands in the Caribbean. It is also one of the easiest to get to. Belize City is less than three hours direct from Dallas/Ft. Worth, Houston, and Miami! Anglers enjoy fishing miles of flats and inshore habitat ideal for bonefish, permit, tarpon, and numerous other species. Bonefishing is orchestrated wading ocean-side flats for tailing fish in the two – five pound range, while other fishing is done from a 16’ Dolphin skiff exploring the labyrinth of flats, creeks, and mangrove lagoons. Turneffe’s permit fishery is considered one of the best in the world, resident baby tarpon are present year round, and larger migratory tarpon also show up in the summer months. Guests stay in beachfront, air-conditioned cabanas with private baths. The lodge’s social areas include the dining room, verandah, open bar, swimming pool, and a well stocked fly shop. T-Flats also has two villas with multiple bedrooms for larger cohesive parties. T-Flats operates a full service PADI diving and snorkeling program as well as a combo diving / fishing package. Non-angling guests can also partake in the flexible “Atoll Adventure” package that includes numerous guided activities such as snorkeling, kayaking, beach combing, bird watching, or simply napping in a hammock. Turneffe Flats Lodge is located on the Eastern (seaward) side of the Turneffe Atoll approximately thirty miles from mainland Belize. The lodge is located on a private picturesque point with coconut palms and white sand beach allowing immediate access to miles of wadeable flats. 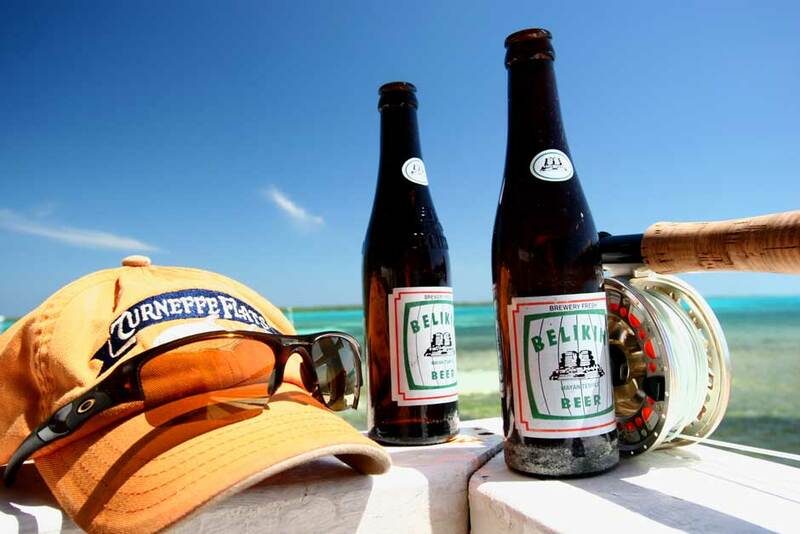 Although one of the most tenured operations in the Caribbean, Turneffe Island’s fishery is always in the spotlight of the fly-fishing travel industry, with frequent reports of phenomenal angling, updated accommodations, well maintained boats and equipment, and wonderful staff. Owners and operators, Craig and Karen Hayes, have been running Turneffe Flats for over two decades, and have built a well-oiled machine of a fly fishing lodge. It is a true institution and one of the most well respected destinations in the saltwater fly fishing community. Turneffe Island is one of the most beautiful and diverse marine ecosystems in the world. Whether you are wading the miles and miles of Turneffe’s flats, fishing or diving on its enormous reef, or cruising through the vast interior of lagoons and backcountry; you will be blown away by the island’s vibrant life, color, and beauty. Many of our well-traveled clients will be first to tell you that Turneffe Island is perhaps the prettiest island in the Caribbean. “T-Flats” is a wonderful destination for families, divers, snorkelers, hard-core anglers, or those who just want to hang out on a private white sand beach and read a book. Saltwater anglers enjoy fishing the waters of Turneffe Atoll because of the wide variety of species available to anglers on a year round basis. Turneffe Island is one of the few places on earth where fisherman can expect to have a good shot at the saltwater “Grand Slam.” Numerous times every season guests come back boasting of landing bonefish, permit, and tarpon all in one day. Turneffe’s unique fishery is a great spot to consider for both beginner flats anglers as well as experienced fly rodders. 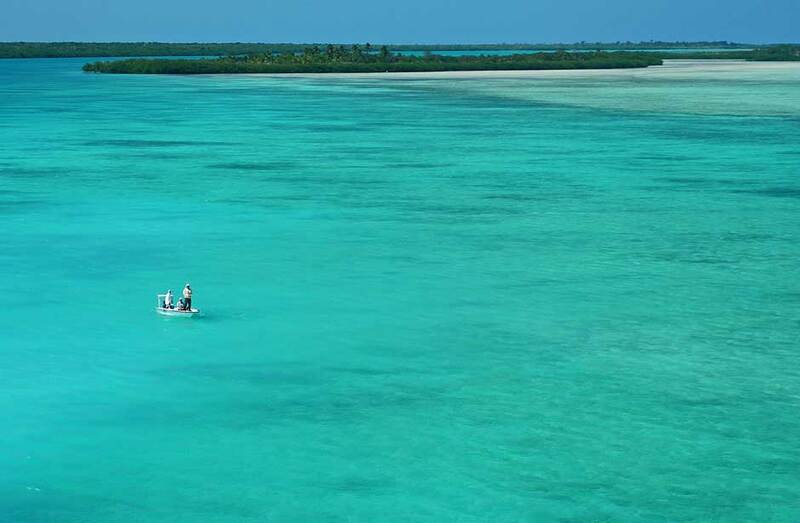 From wade friendly ocean flats to leeward lagoons or interior flats, the atoll has every style and species of saltwater flats fishing available in the Caribbean. All boats at Turneffe Flats are standard 16’ Dolphin Superskiffs with poling platforms and reliable motors. 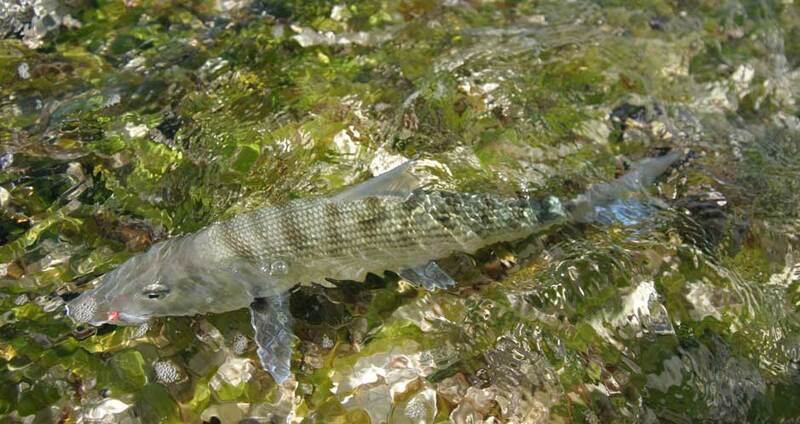 Although typically smaller in size than Bahamian bonefish, they are found in large numbers. The majority of the fishing at Turneffe Flats is done wading the ocean side of the island on hard-bottomed white sand or turtle grass flats looking for groups of schooling bonefish. While the ocean side flats are a wade fisherman’s dream, some of these fish can be a bit spooky at times. This technical style of fishing really hones your skills and keeps the interest level high. Fishermen also have the luxury of getting out of the wind by concentrating their efforts in mangrove lagoons or inner flats in calmer water. Most of this interior flats bonefishing is done from the skiff, and anglers typically encounter a bit bigger and more solitary fish when compared to the schoolers on the reef side of the atoll. Tarpon are another species that is prevalent at Turneffe Flats Lodge the majority of the year. While Turneffe should not be considered an exclusive tarpon destination, there are year round opportunities for resident baby and juvenile tarpon around the atoll. These fish are most often targeted in the mangroves and secluded areas of the lagoon both sight casting and throwing to rolling fish. During the summer months (May – September) larger adult migratory tarpon filter through the island’s flats, creeks and channels, and offer shots for real trophies in the 50-150 pound range. Tarpon will infrequently show themselves laid up or cruising both the flats and along the reef as well – making for an exciting incidental surprise while targeting bonefish or permit. Many anglers visit Turneffe Flats just for the permit fishery. Although there are some wading opportunities for permit, the preponderance of the permit fishing is done from the skiff in the deeper flats and channels surrounding and in the interior lagoon of the island. 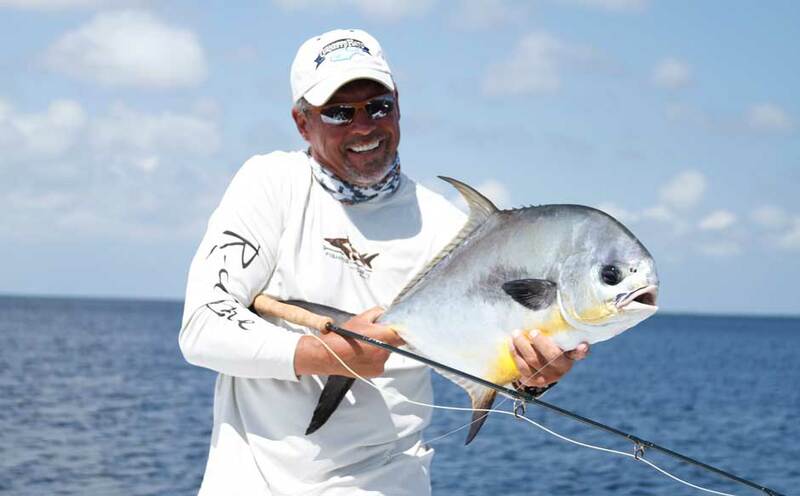 Like many permit fisheries in the Caribbean, anglers should expect consistent opportunity for schooling permit in the 5-15 pound range, and a few shots at larger and more solitary specimens over twenty or even thirty pounds. Presentations can involve small crabs in very skinny water for dedicated feeding/tailing fish, or spawning shrimp patterns in deeper water for more active cruising targets. Regardless of the fishing conditions for the week, Turneffe Island always yields numerous opportunities to tag perhaps the greatest of all saltwater flats trophies. The interior of the Turneffe Atoll offers miles of mangrove-lined bays, creeks and lagoons to fish for various snappers, jacks and barracuda. This can be some very exciting saltwater fishing with either a fly rod or spinning gear. Along the reef, wading anglers can also expect to take snappers and jacks by casting deceiver patterns or poppers into the surf. Spending some time during your stay at Turneffe targeting other species is always fun and usually rewarding. The guides at Turneffe Flats have a reputation as being some of the best in the business. If you have fished often throughout Belize, you will recognize such names as Cabral and Westby – both big names in the Belizean guiding community. They are real deal generational guides – many of which have fished Turneffe for over twenty years. The lodge is equipped with quality rental gear including Sage Rods (8, 10, 11 weights), Abel and Hatch Reels (left and right hand retrieve), as well as Patagonia and Simms flats boots for those who don’t want to bring their own gear. The lodge also has a nice fly and gift shop that carries flies, terminal tackle, sunscreen and some souvenirs. The lodging at Turneffe Flats Lodge is as nice and comfortable as you will find in any dedicated fishing lodge, and consistent updates have heightened comfort and freshened up each of the lodge’s cabanas and villas. Guestrooms accommodating 16 anglers per week are about 450 sq. feet and have ample room for guests to unpack and feel at home. 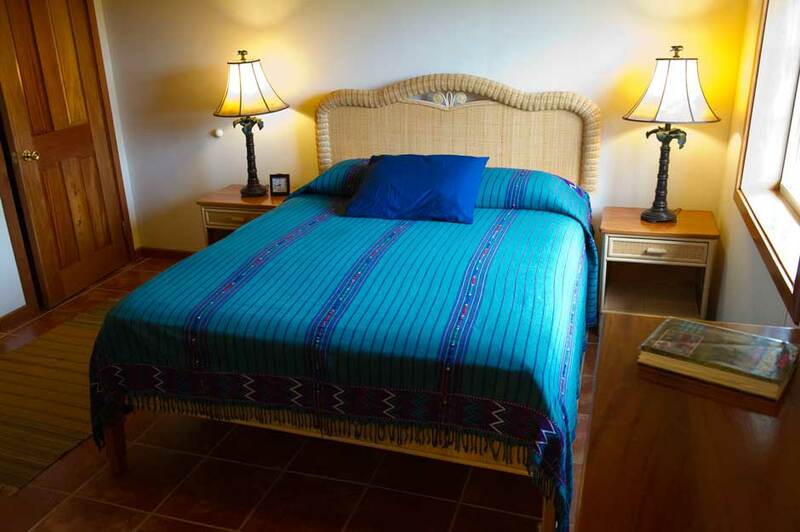 All rooms are centrally air-conditioned and each room includes a large, private bath. Furnishings include a queen-sized bed and an extra long single bed. Each of the lodge’s eight double occupancy cabanas has its own verandah overlooking the turquoise water of the western Caribbean. Two villas (Reef Villa and Garden Villa) offer a little more square footage, a common area with kitchenette, satellite TV and three bedrooms. The Garden Villa also has a small exercise facility on the bottom floor as well as a meeting area that works well for business or family oriented gatherings. The main lodge is a fully air-conditioned facility where guests take meals and relax at the bar. The bar is well stocked with liquor, red and white wine, and of course Belikin, the local beer. Three meals are served daily and consist of traditional Belizean fare of seafood and fresh local produce. There is a beautiful swimming pool and two large upper and lower decks attached to the lodge that are great spots to enjoy the gorgeous view and a cocktail. A gift / fly shop is adjacent to the main dining room and sells souvenirs, some flies and terminal tackle, sunscreen, and a few other necessities you may have forgotten. The property sits on a gorgeous sandy point on the northeastern side of Turneffe Atoll with an idyllic view of the reef out front. The grounds surrounding the property are always well manicured and well kept, and there is not another soul around other than the other handful of guests at the lodge. If you have not had enough fishing after a full day on the water, the expansive flat in front of the lodge is home to several happy schools of bonefish for you to chase in the late afternoon. Some of the best bonefishing sessions occur unguided, after cocktail hour, as the sun is fading over the island. Guests at Turneffe Flats fly into the capital of Belize, Belize City. Belize City is serviced by both American and United Airlines from most major U.S. cities. Once in Belize City, guests are met and escorted to the dock in the city harbor to board a comfortable, forty-eight foot, closed cabin power boat for a ninety-minute and scenic ride to the island. Turneffe Flats Lodge can easily be reached in half a day with a direct three-hour flight from Dallas, Houston or Miami. Turneffe Flats Typically operates on a seven night / six day package based on a Saturday – Saturday itinerary. Package costs are based upon this schedule, however three night / two day and four night / three day itineraries are available under some circumstances. Please inquire for details. 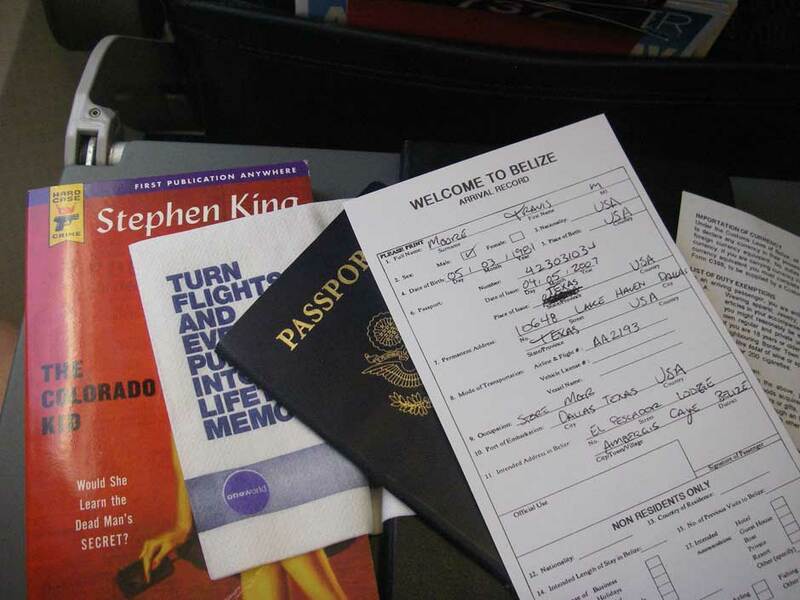 Travel to Belize City. Upon arrival in Belize City, you will be met and escorted to a local marina for the ninety-minute boat ride to the island. No guided activities planned on day of arrival. Fishing, Diving, Snorkeling, Swimming, Kayaking, Bird Watching, Beach Combing, Napping, Eating and Drinking Days! After breakfast guests are transported by boat back to Belize City for commercial connection home. Turneffe Flats is open year round, and Turneffe Atoll enjoys excellent fishing conditions more or less all season long. Belize has a subtropical climate that is uniformly hot and humid, although it is tempered by the trade winds. The dry season is from February to March with another brief spell during August, while the hurricane season is from late July to October. Temperatures during the summer months can become extremely warm, and anglers who are especially bothered by heat may want to consider avoiding the summer heat. However, do know that Turneffe Flats does have comfortable fully air conditioned facilities to get out of the heat on a hot summer day. A comfortable southeasterly trade wind blows throughout most of the year, and tends to pick up in February and March. June is called the ‘rainy season’ in Belize but this relates primarily to the mainland rainforest and has little effect on the coastal regions. On rare occasion during the winter months, cooler temperatures and northerly breezes can be tougher on anglers, but for the most part Belize is a very consistent wintertime fishery. 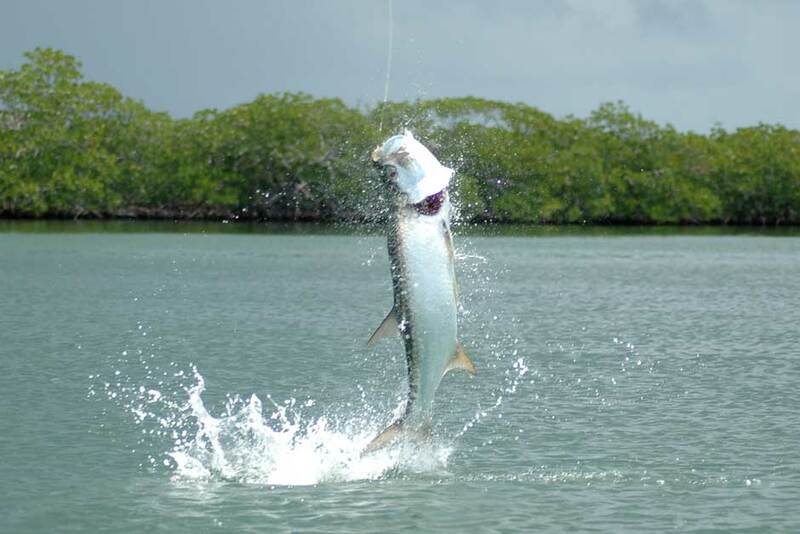 May – August are considered prime tarpon months for migratory fish exceeding one hundred pounds. For those snook anglers, the wintertime months are the best time to find this elusive species on the flats or in the mangroves. Turneffe Flats caters to non-anglers with its first class dive package, adventure atoll package, and the “R&R” package. Guests not interested in fishing are well entertained while spouses and travel partners are off on the flats. Belize consistently ranks among the top Caribbean dive destinations and Turneffe Flats is ideally located to take advantage of some of the best diving in Belize. Over 60 sites around the Turneffe Atoll are within easy reach, and Lighthouse Atoll, home of the famous Blue Hole, is only an hour’s boat ride away. As the largest coral atoll in the Caribbean, Turneffe offers varied underwater terrain of spur and groove formations, sandy ledges and sheer walls providing spectacular dive sites to suit every level of diver. The eastern side of Turneffe is protected by 35 miles of reef. It shelves gradually to about 60 ft. where spur and groove formations meet the wall. Nutrients produced in the mangroves are dispersed on the reef by the tides and gentle currents causing huge concentrations of feeding fish on this side of the wall. On the west side of the atoll, the mangroves of Turneffe provide shelter from the swells and large waves. A gently sloping bottom lies at 30-50ft and large reef formations cover the white sand bottom. The reduced wave action allows sponges and soft corals to grow magnificently and sea feathers of 5ft tall are common. In the North, the reef is buffeted by the Caribbean swells and trade winds but on the calmest of days divers can explore these almost untouched areas. Schools of mutton snapper, atlantic spadefish and permit hover 80ft above the sea floor and blue and rainbow runners make close passes. Turneffe’s most southern point is dotted with a variety of popular sites that are featured in many of the Belize dive guides. The Elbow is probably the most famous site here and the ocean current over deep reef attracts big schools of pelagic fish. The other sites vary enormously as you move up the southwest or southeast side with everything from patch reef nurseries, dramatic coral formations to steep drop-offs. Throughout the Turneffe Atoll, you will see a variety of hard and soft corals as well as all of the Caribbean tropicals, eagle rays, sharks, turtles, dolphins, moray eels, and occasionally whale sharks in addition to large schools of permit, horse eye jacks and dog snapper. Most diving is done from a forty-eight foot Custom Dive Boat. This is a large, comfortable, shaded boat allowing us easy access to the entire Turneffe Atoll as well as the Lighthouse Reef. A limited number of guests mean that there are seldom more than six divers sharing this spacious dive boat. Instruction is available at Turneffe Flats through their PADI Instructors if you are a first time diver and want to learn. Certifications include Open Water Referral and Advanced Open Water Certification (Underwater Navigation, Deep Diving and 3 elective dives) as well as a full range of Specialty Courses. ‘Discover Scuba Courses’ are also available for those who wish to experience SCUBA for the first time. Explore the wonders and beauty of the Turneffe Atoll at your own pace. 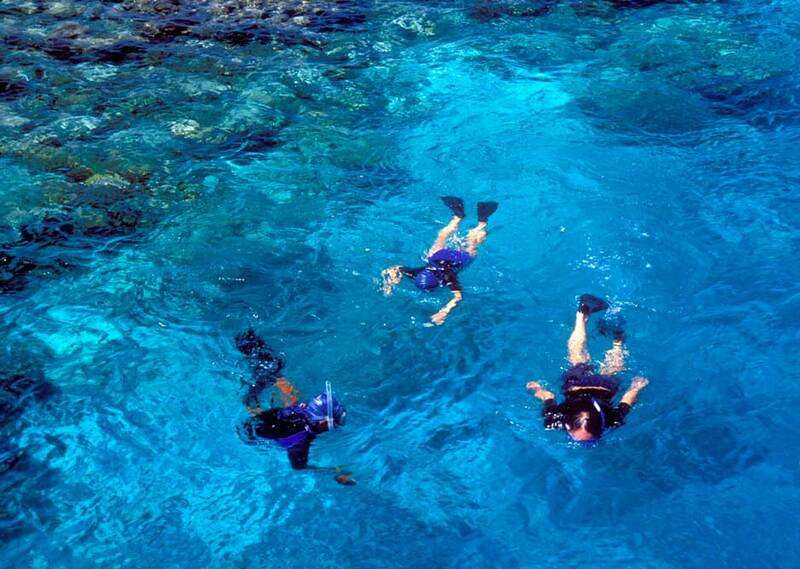 Snorkel, bird watch, or pursue a number of other fun and informative activities. If you feel like it, stay at the lodge and lounge on the beach. Every day offers a great new adventure and a perfect opportunity to relax – that’s what the Atoll Adventure is all about. Choose from a variety of daily-guided activities led by one of the Atoll Adventure guides, all of who are informative and fun. Turneffe Flats’ twin-engine, canopied boat is at your guide’s disposal for exploring the reefs, mangroves, creeks and lagoons that make Turneffe the largest and most biologically diverse atoll in the Caribbean. With at least 60 species of birds at Turneffe, birding is another highlight. You may also want to tour the atoll searching for manatees and dolphins or enjoy an afternoon kayaking. The Atoll Adventure Program is a very flexible and is tailored to fit the particular interests of each group. Of course, exploring the 300 square mile Turneffe Atoll can itself be an adventure. Turneffe has a fascinating history, including Mayan fishing and trading settlements dating to 400 A.D. Turneffe was also a favored hideout for Blackbeard, one of the notorious pirates of the Caribbean. For most guests, learning about the history of Turneffe as well as the fascinating history of Belize is one of the more enjoyable parts of their visit. Other Atoll Adventure activities include: snorkeling, night snorkeling, Mayan ruin tours, mainland tours, manatee, dolphin, and crocodile tours, flats walking tour and Mayan cooking class. “Rest and Relaxation” – This package is ideal for those who wish to relax and enjoy the beauty and serenity of a private tropical island. There are hammocks under the palm trees in which to relax and shore walks, sunbathing, swimming and snorkeling are all readily available. This package does not include any organized activities but an inland tour of the Mayan Ruins or Belize Zoo can easily be arranged during your stay. Tailwaters Travel must adhere to the cancellation policies of the guides, outfitters and lodges which it represents. Turneffe Flats Lodge’s policy follows: A refundable 25% deposit is required to secure all reservations. Final balance is due 60 days prior to departure. All fees are refundable up to sixty (60) days prior to departure minus a $100 cancellation fee per rod. Within sixty days of departure, all funds are non-refundable unless a replacement client is found. Refunds of deposits/payments made on credit cards will be charged a 3.5% service charge to fully compensate Tailwaters Travel for all bank charges incurred. Refunds or credits are not given for fishing time lost due to inclement weather. Receipt of deposit and/or final payment is acknowledgement that registrant has read and accepts the cancellation, refund and responsibility clauses.